This entry was posted in Children, Holidays, Parenting and tagged alcohol, Atlanta, family, holiday, IUD, Miley Cyrus, Orange Is the New Black, Orkin, psychotropic drugs, thankful, Thanksgiving, Virgin Islands by jaclynschoknecht. Bookmark the permalink. 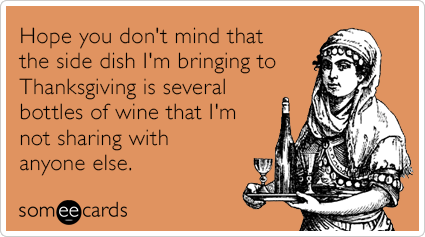 My list is pretty similar – I am especially thankful for prosecco, tequila and my sippy cup this year. I love this so much I gave taken precautions to make sure Gmail doesn’t put my MommyEnnui updates anywhere but the Primary folder! And my husband– let’s call him Robot Guy– gets to go to Hawaii on business next week. What gives? Thanks, Kris! I say we schedule an important blogger “meeting” in Costa Rica sometime soon!